Welcome to Savannah, a beautiful southern city that is brimming with gorgeous architecture in historic homes and museums, natural beauty and fascinating history. Savannah, Georgia is known for all of these things; but it’s also known for being the most haunted city in the United States. The Marshall House was built in 1851, and as one would imagine, played host to a variety of visitors throughout its long history. It was once a hospital for Civil War soldiers, a boarding house and various other businesses. Its paranormal activity centers around the fact that many people, both children and adults, died of yellow fever there during its years as a hospital. Consistent reports of loud, inexplicable noises, water faucets turning on and off and objects moving on their own have spooked even the bravest of guests. But perhaps the most disturbing reports are those of the full body apparitions that have been reported in hallways, guest rooms and various other parts of the hotel. Make a stop into this historic hotel on East President Street to discover for yourself if the lost soul of Anne Powell still lingers here. Her life came to a tragic end when she fell out of the window of room 204. Some say she committed suicide and jumped because she fell madly in love with a sailor who left her when he found out she was pregnant. Other accounts say that she was in a relationship with a married man when she became pregnant. But there is one constant about Anne’s sad story: She never quite got over what happened and even in her death, still lives on in the hotel. Guests of room 204 have had the most encounters with poor Anne, including seeing her standing over them and feeling as if someone is touching their cheek. Other guests report items missing from their room, including women’s undergarments, which mysteriously show up in other places inside and outside of the hotel. If you’re bold enough to stay in room 204 today, you’ll be asked to sign a waiver promising not to request your money back! 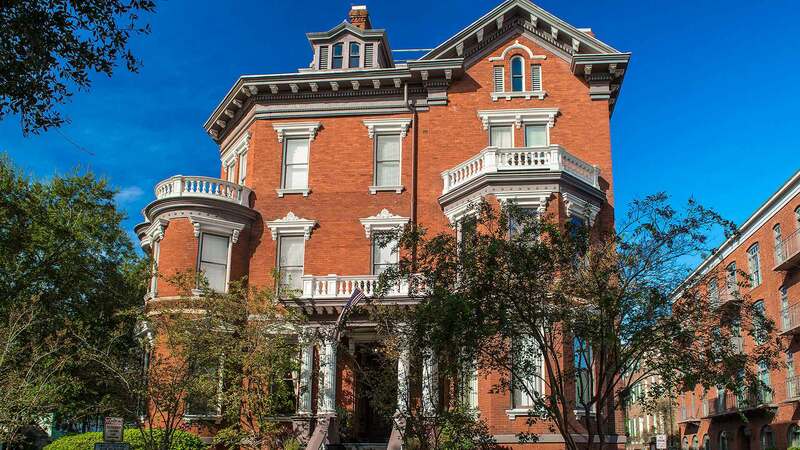 One of the most prestigious bed and breakfasts in Savannah, the Kehoe House was built in 1892 for the owner of an ironworks foundry, William Kehoe. His ten children, he and his wife lived in the magnificent Queen Anne style mansion. It was during that time that a tragic event occurred – the death of his twin children. The story is that the young twins were playing in a chimney when an accident killed both of them. It is the spirits of the children that many believe are haunting this beautiful hotel. Guests have complained of hearing the sounds of noisy children running down the hallways, only to realize there were none present. Other reports include strange encounters in room 201 and 203. Those who’ve stayed in these rooms have seen a child standing over them and then disappearing. The staff at the historic inn has also experienced inexplicable events – from doors unlocking and opening by themselves, to the disembodied voice of a little boy saying, “come play with me,” and the fact that a light appears in the cupola window, when no one has gone up the stairs to turn it on. 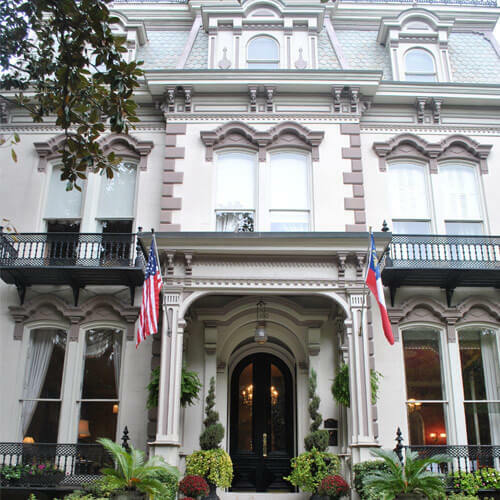 This iconic inn is located in Savannah’s historic district and was the family home of Samuel Pugh Hamilton. Its paranormal history dates back almost that far, with stories of ghost sightings by Hamilton’s children who reported seeing children appearing and disappearing throughout the house. Over the years, after it became a bed and breakfast, guests were startled by the sight of a soldier in a Confederate uniform sitting or standing at the edge of their beds. And other stories include what sounded like a wild party going on – when there was nothing or no one in sight. Historians explain this as a reference to a one-time resident of the home, Joe Odom, whose wild parties were made famous in the book Midnight in the Garden of Good and Evil. With Victorian mansions and elegant buildings that date back centuries, it is not hard to fathom that Savannah has had its share of lingering spirits. In fact, the haunted tales that surround this southern gem are too numerous to mention. Many believe that nearly every building in the historic district has a ghost story to tell.